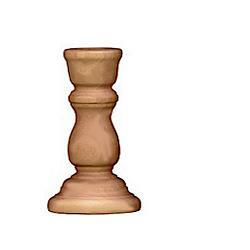 3" WOODEN CANDLESTICK. PERFECT TO USE AS A STAND FOR OUR 25CM POLYSTYRENE TORSO FORM. PAINT IT, GOLD LEAF IT OR MOSAIC IT!